True Strength hails from the US and is a Classic 70's inspired Power Metal outfit that formed back in 2012 by both Guitarist-Ryan "The Archangel" Darnell & Drummer- Chris Clark. Ryan Darnell helps shed some light on how the group chose their band's moniker: "The 'True Strength' name was derived from Psalm 118:14: "The Lord is my strength and my defense; he has become my salvation." In some translations it says "The Lord is my strength and my song; he has become my salvation." Originally I had planned the True Strength logo with Psalm 118:14 below it but I realized it looked too much like Stryper's." 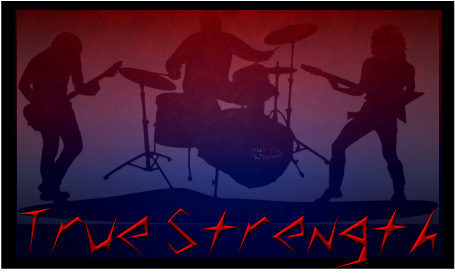 Some bands that have played a part in influencing True Strength's sound are Iron Maiden, Stryper, Bloodgood, Saint, & Megadeth. True Strength has 2 releases to their credit 2014 - 'The Cross Will Always Prevail' , and 2016 - 'Steel Evangelist'. The release of the band's sophomore album saw some major changes to the line up with ​Lead Vocalist Rus Gib and Drummer Chris Clark both parting ways. Frontman Rus Gib was replaced from within the band by founding member Ryan Darnell who played Guitars & Bass on their debut 'The Cross Will Always Prevail'. Chris Clark was replaced on the kit by Drummer Ryan Mey. Axeman Josh Cirbo continues in the position of lead Guitarist to round out this 3 piece band. Drummer Chris Clark has by no means abandoned the music scene. We find that Chris has been toying with the idea of starting up another Christian band that would have a lyrical focus on Christian history. He has been working with another friend of the band to get that started and frontman-Ryan Darnell, more than likely, will be assisting him in order to get this project off the ground. In 2016, True Strength released their sophomore album titled 'Steel Evangelist' which was recorded, produced, mixed and mastered by Robert Sands and released on an independent label.​ Curently the album is a digital only download. The CD version of this release is expected to follow later this summer. All digital sales of the album will be donated to the *International Christian Concern http://www.persecution.org, which assists persecuted Christians and their families around the world. This 2016 release has that traditional Classic 70's feel to it but not only in song structure but also production along with chosen Vocal deliveries. Even though their are Classic elements expressed, we can still find some newer elements mostly through many of the differing techniques of guitar shredn'. True Strength's style falls more in line with what I call "Biker Metal" with more of a raw, not too polished, in your face sound similar to what is found in bands like Faith Factor, Saint, or even Judas Priest. Frontman Ryan Darnell has a soulful Raw delivery and is responsible for the backing Vocals as well where he reaches some notes in the upper regions. There are moments when Ryan's Vocal work reminds me of Eli Prinsen(The Sacrificed, Sacred Warrior) however, there's also a soulfulness present in the veins of 80's era Vocalist Randy Stonehill. The guitars are handled by Ryan Darnell(Rhythm Guitars) & Josh Cirbo(Lead Guitars). When it comes to the guitar work on this 2006 release, one is immediately taken back by the level of shred presented here. Yes, it' easy to tell that this isn't Ryan & Josh's first release. There were a few moments where I thought I smelled smoke ascending from the fret boards as my speakers began to melt down. Josh and Ryan deliver up a molten metal buffet of hard, galloping, driving, Power Metal to sink ones teeth into. One thing I really like about the Guitar play is that there are plenty of solos which allow the tracks the opportunity to breathe while giving the listener a break and a chance to focus on the instruments and skills of each band member. Ryan Mey takes his position behind the kit as the new time keeper for the band. Mey does a good job of holding his own while mixing things up with plenty of time changes. There's a rawness to Mey's work in the mix, that permeates through the album, the kind of raw that is often found with Thrash Metal bands. Even more, we find a number of tracks where the drums go into a all out Thrash hammering technique which doesn't hurt the feelings of this listener in the least bit. A lot of bands these days are recording songs that clock in at around 3-4 min in length which is fine. However, it's noteworthy that True Strength has gone the extra mile and recorded songs that are in the 5-10 min Range more like we find with bands like Theocracy. This extra length gives the band more freedom to mix in solos throughout, giving 'Steel Evangelist' a total running time of around 70 min. ​" Don't Take the Mark of the Beast"
...Then it'll be too late! Don't take the Mark of the Beast! We will die for Christ! ​Don't take the Mark of the Beast! My only complaint with this release is that I think the vocals are just a little to forward in the mix. However, I would definitely prefer them to be more out front than too soft in the mix where you can't understand what the vocalist is trying to convey.